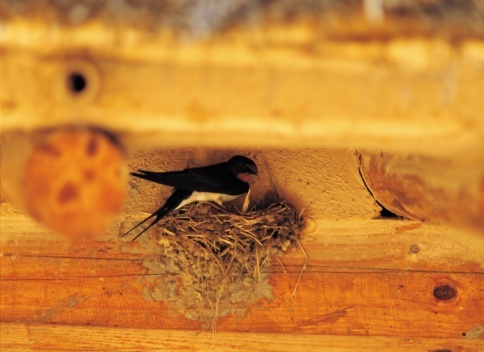 A bird pecking at a window a couple times may seem like little more than a minor annoyance. That same bird pecking viciously at the windows day after day is a bit more disruptive and may even harm the bird's beak. To stop birds from aggression against your windows, the key is to make the glass temporarily less reflective. The males of some bird species become extremely territorial when seeking out the ideal nest location. During this time and on through the entire May to August breeding season, these males aggressively defend their perceived territory. The territory may be as small as an urban backyard or it may cover many acres, depending upon the species. When light hits window glass at certain angles, a nearby bird can see his own reflection. A territorial male perceives that reflection as another male, a serious threat to his space. Males with this territorial mindset may also attack other reflective surfaces, such as a vehicle's side mirrors. 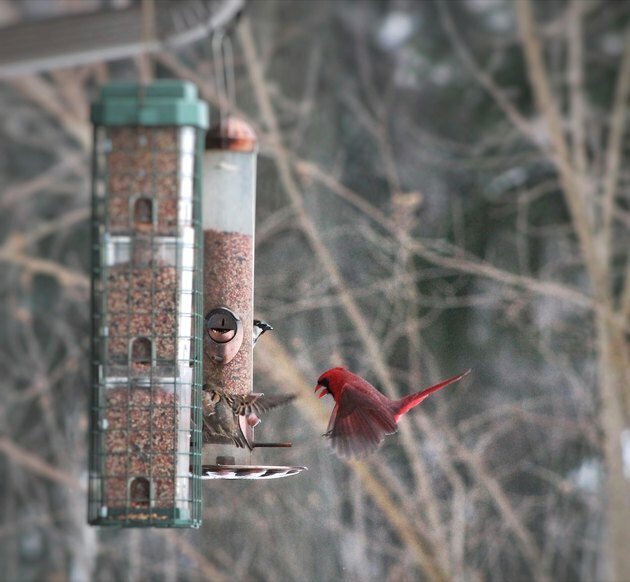 Northern male cardinals sometimes attack windows. The key to stopping any bird from attacking a window is to make that surface less reflective. Closing the shades or blinds may not be enough to do the trick, since the glass is still shiny on the outside. To determine which areas of the window to treat, identify the spots where the birds attack most often. Temporarily tape or tack window screen mesh or a fine netting material over that area, which still allows light through but hinders potential reflection. Non-shiny plastic sheeting, such as the type used for a drop cloth, will also work. For even better results, tape or tack the plastic up along the top edge of the window and allow it to hang freely, moving in the breeze. The movement will scare birds away. Since this is not exactly an attractive home improvement, you may wish to limit the flapping plastic to windows facing a side or back yard. You could also make a temporary mesh screen from dowel rods or flat strips of wood and matte window screen mesh. Cut a piece of mesh large enough to cover the window, then staple the mesh at the top and bottom to the wood pieces cut to the width of the window. Hang the wood from eye hooks or temporarily screw it to the window frame, rolling the assemblage up for storage when no longer needed for the season. 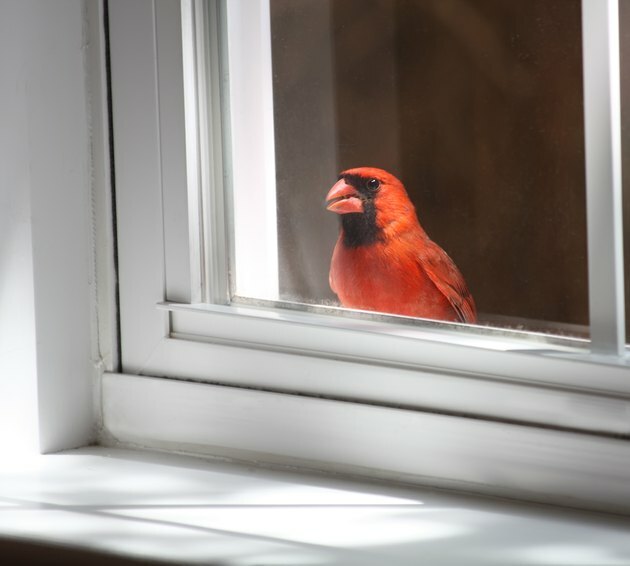 Keep bird feeders away from windows in May through August to help prevent window attacks. Bird feeders positioned near windows may be problematic, as a territorial bird seeking out a meal may see his reflection while he's at the feeder. Move the feeders away from windows, at least during the spring and summer months. 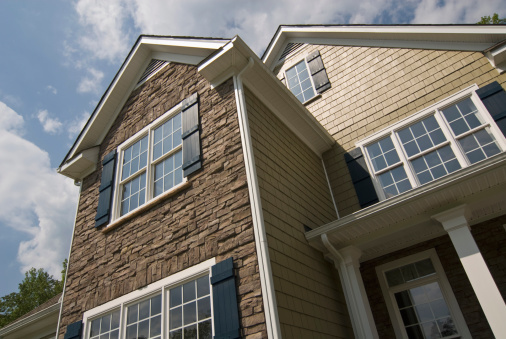 Birds may divert their attacks to other windows once you've made that main "problem window" less reflective; you may need to cover other windows on the same side of the house with anti-reflective materials, as well. Temporary window film, usually used on the inside of windows to add privacy, can instead be placed on the outside of a clean glass window Choose a film that looks translucent and less shiny, such as the type designed to give clear bathroom windows a frosted appearance. 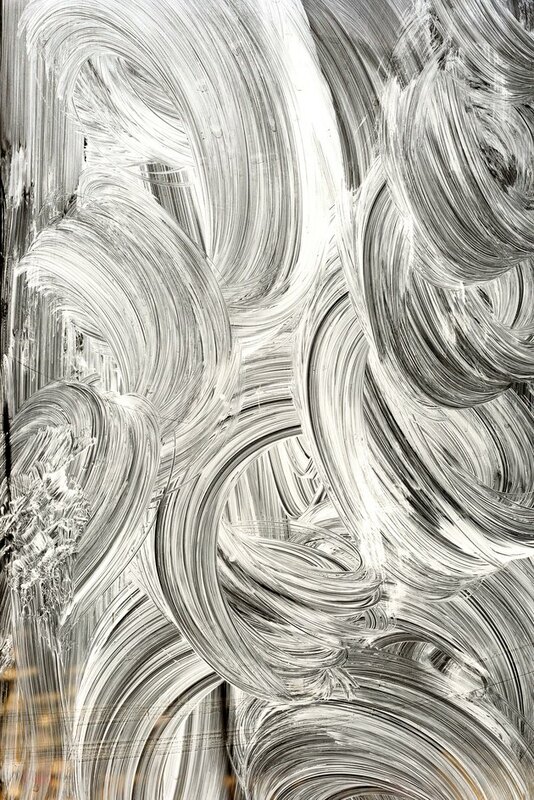 A soap or paint designed for windows can also be used. If birds are attacking their reflection on your vehicle's mirrors, tape a plastic or cloth bag around the side mirrors when you're not using the vehicle. Just remember to take the bag off before driving. While it's not so common in a city, large birds such as turkeys may attack their own reflections in shiny car finishes. If this happens, either stop washing the car during the summer (eliminating the reflection) or keep it in a garage or another area out of the turkey's reach. Temporary paint or soap can make window glass less reflective, preventing bird strikes. 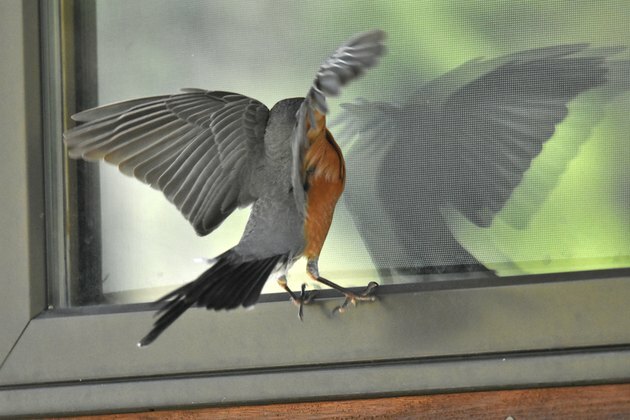 While the behavior is not the same as attacking windows, birds may inadvertently slam into your windows while flying. This happens when they see a reflection of the outdoors; they think they're flying freely into a spacious area outside. This could cause serious injury or even death to the bird. To prevent this, apply strips of white tape every couple inches across your window, or apply a perforated window film that looks like a window screen from the inside but appears opaque on the outside. Drawing on the outside of the window with soap or with temporary glass paint can also help, as do all of the methods used to keep birds from pecking at windows.